We carry out a concrete security analysis of signature schemes obtained from five-move identification protocols via the Fiat-Shamir transform. 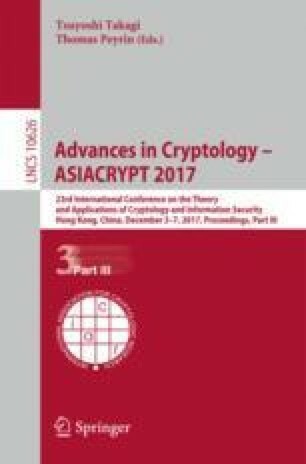 Concretely, we obtain tightly-secure signatures based on the computational Diffie-Hellman (CDH), the short-exponent CDH, and the Factoring (FAC) assumptions. All our signature schemes have tight reductions to search problems, which is in stark contrast to all known signature schemes obtained from the classical Fiat-Shamir transform (based on three-move identification protocols), which either have a non-tight reduction to a search problem, or a tight reduction to a (potentially) stronger decisional problem. Surprisingly, our CDH-based scheme turns out to be (a slight simplification of) the Chevallier-Mames signature scheme (CRYPTO 05), thereby providing a theoretical explanation of its tight security proof via five-move identification protocols. E. Kiltz was partially supported by ERC Project ERCC (FP7/615074) and by DFG SPP 1736 Big Data. J. Loss was supported by ERC Project ERCC (FP7/615074). J. Pan was supported by the DFG grant HO 4534/4-1.